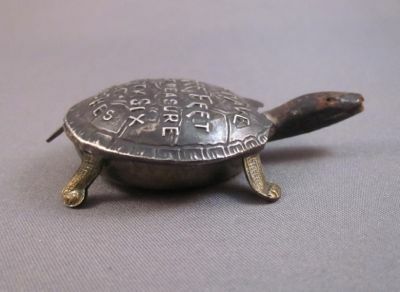 I just returned from the Antiques Garage Flea Market in Chelsea with this whimsical turtle-shaped tape measure with an inventive repair. 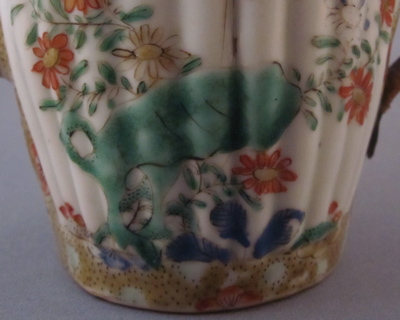 It was purchased from dealer Janet West, who has great taste and wonderful eye for the unusual. 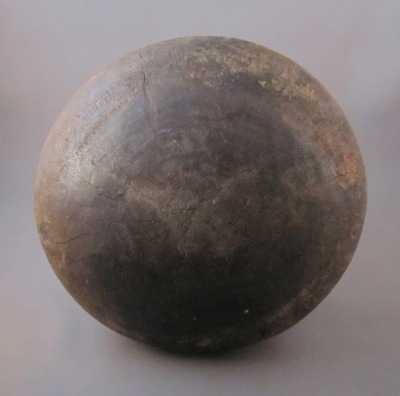 The sterling and brass tape measure dates from the first quarter of the 20th century and measures 2-3/8″ long. 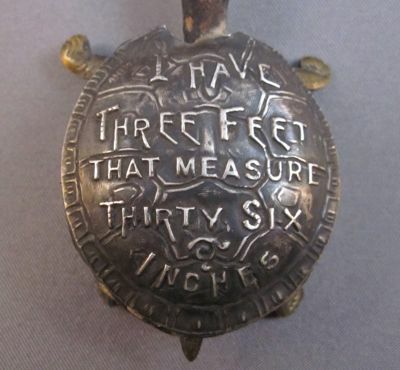 Written in a quirky font in raised letters on the back “I have three feet that measure thirty six inches”, a witticism pertaining to the 3′ cloth tape measure once concealed inside the shell. 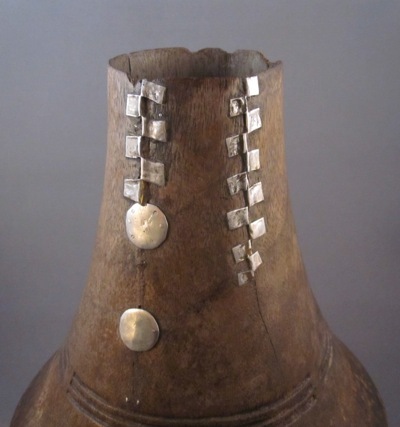 When the original silver head became detached and lost, a clever person whittled a new head out of wood, carefully carving out delicate facial features. 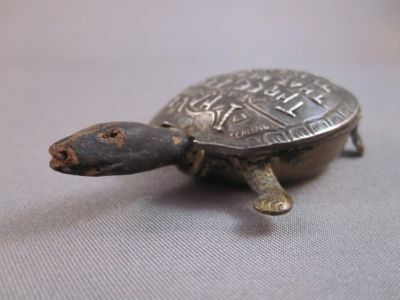 So even though this perky little turtle began its life as a sewing implement for an adult, it was reborn as a toy to be played with and loved by the next generation. This lucky guy still has his original silver head, but I think mine has more character. It’s no wonder the original head and flimsy cloth tape on my little fellow became detached. I would bet a small child pulled the head out one too many times, just as I would have done at that age. 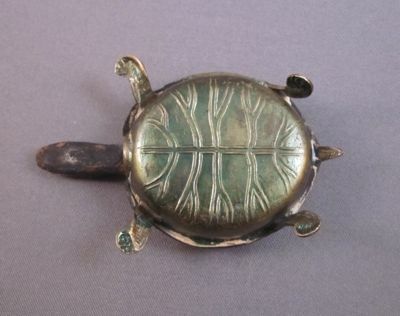 I am a turtle lover and would have bought the tape measure even if it were in “perfect” condition but as you know from reading my posts, perfection is in the eye of the beholder and to me this one IS perfect. 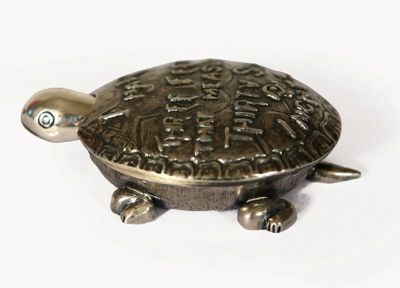 My love of turtles began in the second grade when I was taken on a class trip to the Turtle Back Zoo in West Orange, NJ. 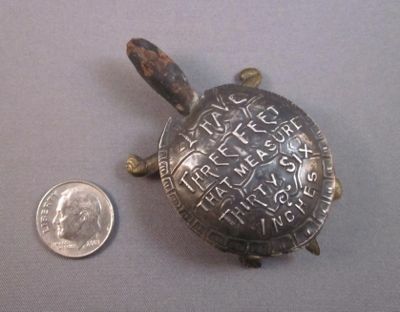 Soon after that I had a quick succession of pet turtles, all named Cornelius, and all buried in the back yard of our Short Hills, NJ 1920s English Tudor style house. 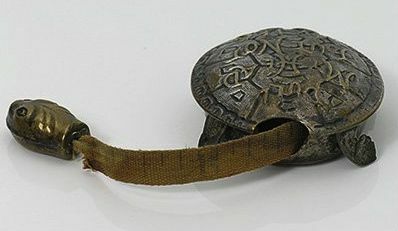 As the turtle tape measure and my old house date from the same period, the original home owner might have owned my tape measure! Now we have dozens of unnamed turtles, which I look forward to seeing each spring, in the pond at our house in Upstate NY. 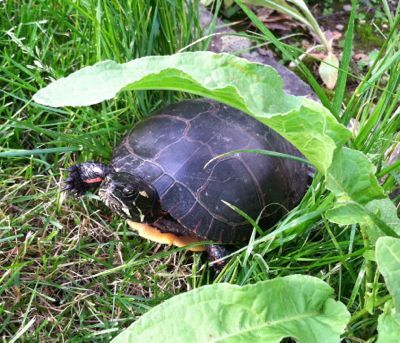 I took this photo of an eastern painted turtle laying her eggs in our garden last summer. 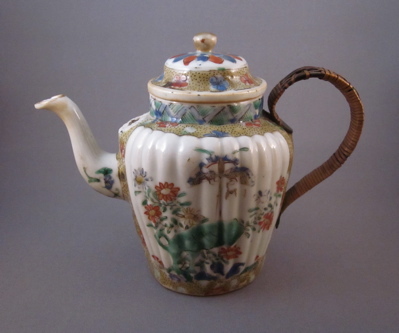 This early porcelain teapot was made in China in the late 1600s and is a good example of an original form shifting to become current with the next generation. 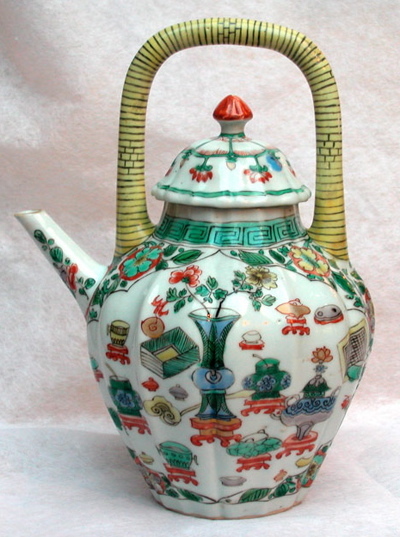 It is decorated in the Wucai palette, consisting of five enamel colors outlined in black and measures 5.5 inches high and 7.25 inches from handle to spout. 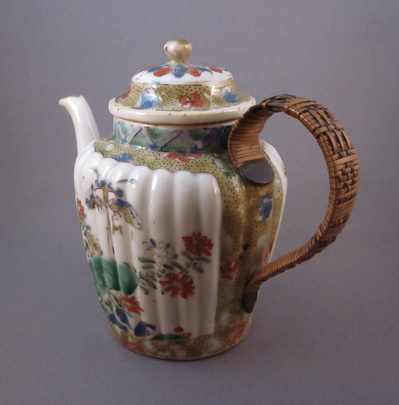 What I love most about this piece is that by the time the original fixed upright handle broke off, it was replaced with a rattan-wrapped metal handle attached to the side of the teapot. 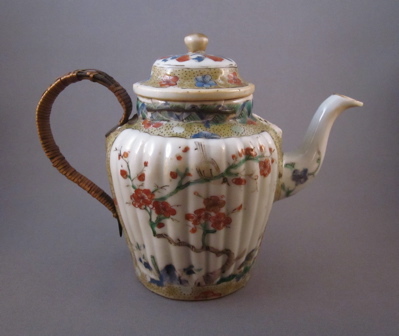 Most likely the break occurred over one hundred years after the teapot was made, which explains why the placement of the new handle is more in keeping with teapots of the early 19th century. 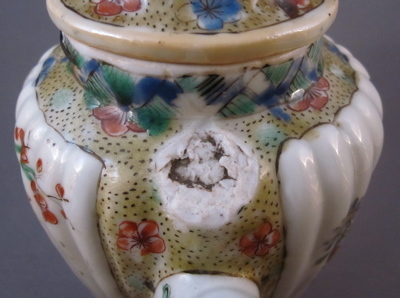 This act of altering the original form of a piece is reminiscent of clobbered wares; a practice of painting over simply decorated porcelain with multi color enamels to appeal to changing styles. 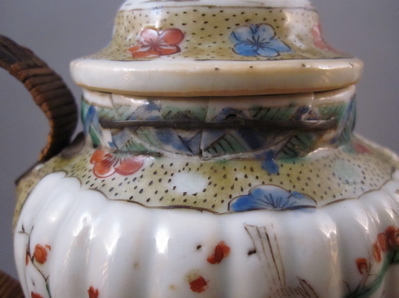 An added bonus is the presence of long meal staples at the top of the neck, holding together two broken pieces back in place. 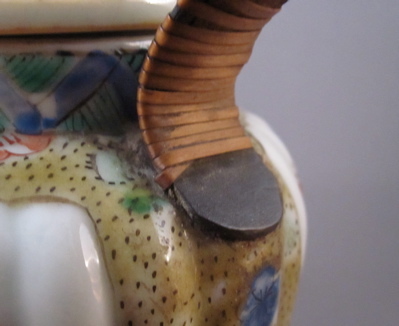 This teapot shows what the fixed vertical handle on my teapot would have looked like before the replacement handle was attached to the side. 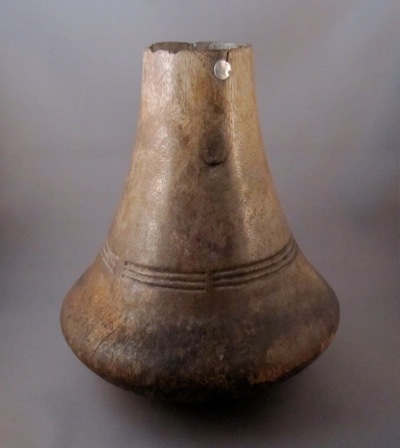 A wooden milk container, known as ekyanzi, was made in Uganda, Africa by the Hima/Bahima tribe in the mid-20th century. 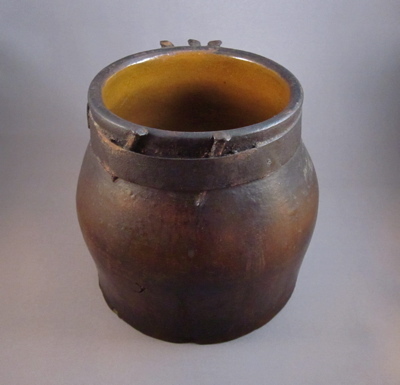 It measures 9-1/2″ tall, with a 2-1/2″ diameter opening. 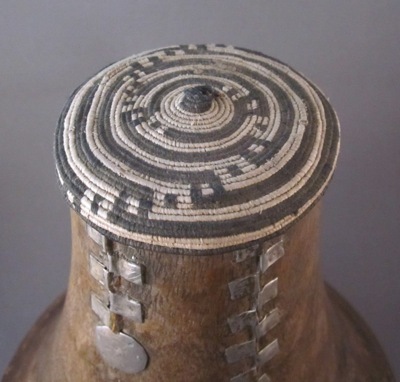 The wonderfully graphic indigenous repairs, including zipper-like alternating folded tabs to mend cracks, and coin-shaped plugs to fill holes, are made of recycled aluminum. 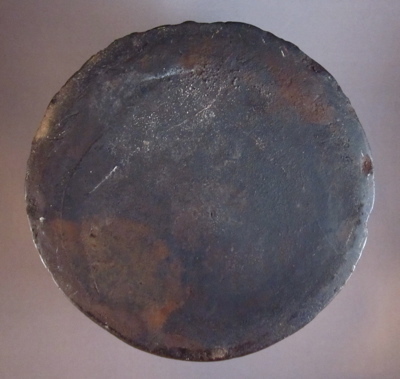 The equally graphic woven covers are not always found with the pots and are collected independently. 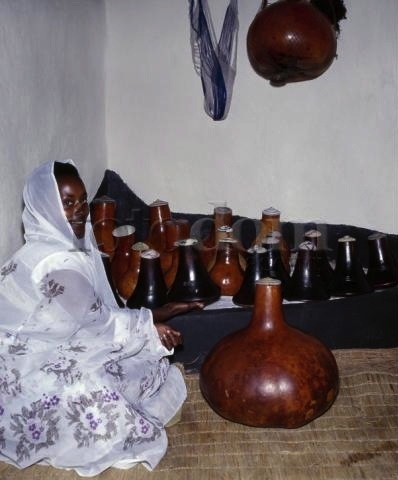 A Bahima girl with her family’s wooden milk pots. 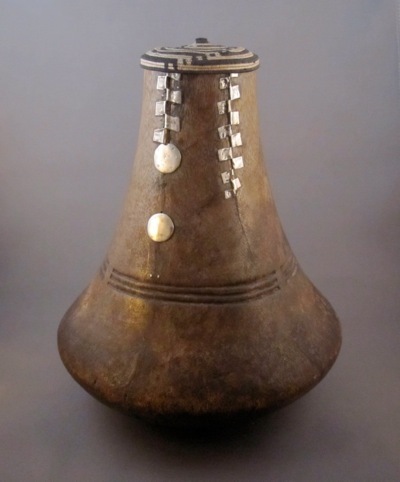 The lighter colored pots are made from gourds. 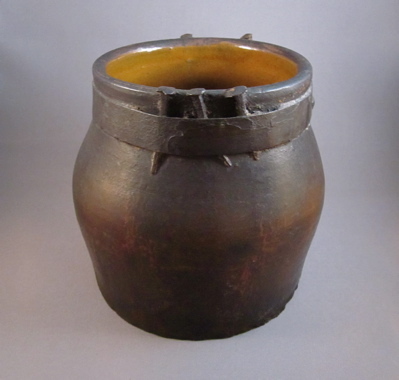 I found this great little red clay pottery pot in Maine a few years back and it continues to amuse me. 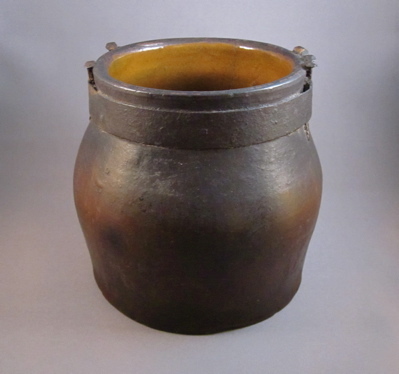 It has an appealing patinated surface and an unusual thrifty make-do repair, typical of pieces found in New England. 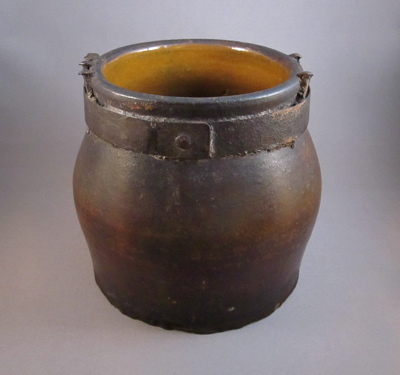 I believe it was made in Massachusetts in the mid-1800s and measures 6″ high, with a top diameter of 5″. 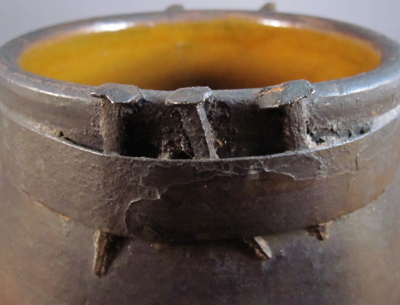 When the pot cracked, no doubt due to excessive use, an iron band was slipped over the neck, but had to be made wide enough to clear the slightly flared ridge. 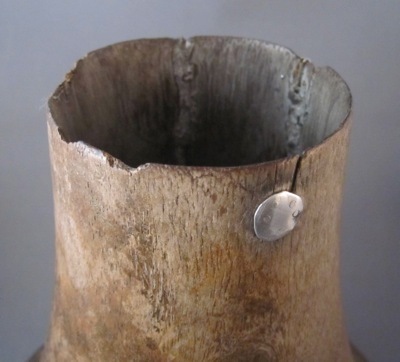 So to tighten the band and seal the crack, five hand forged square nails were wedged between the metal band and the outside wall of the pot, forming a snug seal. 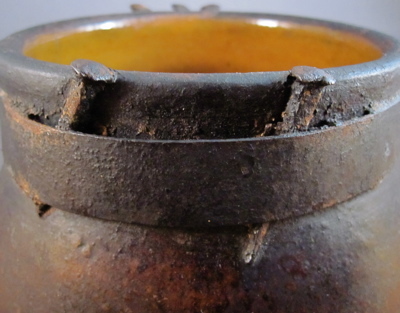 This novel repair certainly did the trick to make the pot function once again and also inadvertently transformed it from a plain vessel into a folksy curiosity.